Just a quickie. 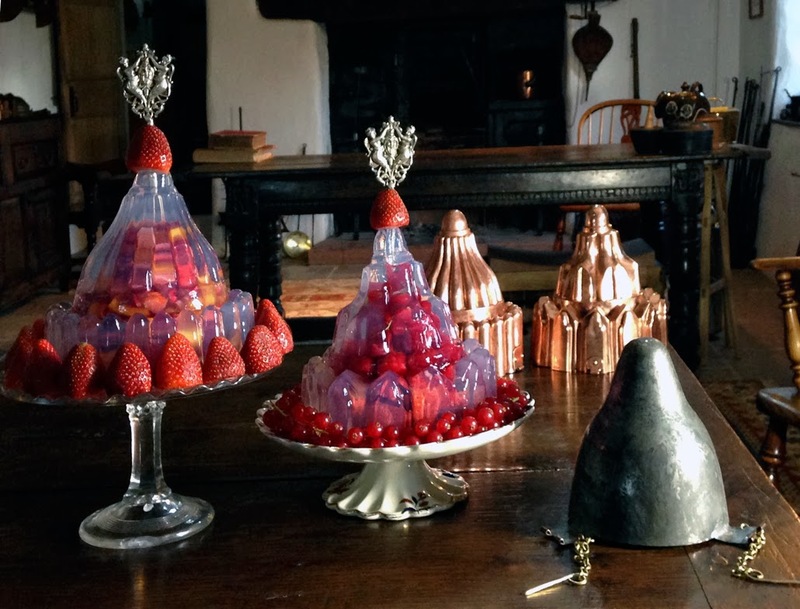 I have just spent a couple of days filming with a BBC crew making a number of items of period food. 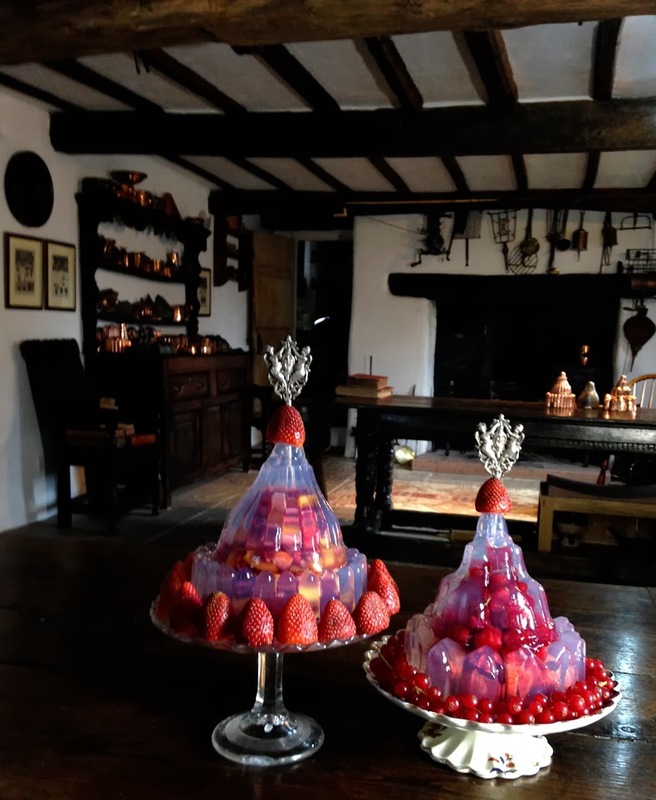 Yesterday I put together a couple of nineteenth century maraschino fruit macedoine jellies to show how glamorous Victorian food could be - at least on the upper class table. I am posting a few iPhone snapshots I took in my kitchen this morning of the jellies with their fruit garnitures. I have garnished them with a couple of nice silver hatelet skewers from the 1870s, which gives them a striking sense of formality. A neo-gothic macedoine mould and liner from Urbain Dubois, Cosmopolitan Cookery (London: 1870). I am fortunate enough to own a complete example of this two component mould, so am able to replicate these stunning Victorian entremets with a great deal of accuracy. Two different macedoine jellies with their moulds. To stop it moving or floating in the jelly, the inner liner is clipped to the outer mould. Very good actually. And also they have a very light mouthfeel. Someone has commented on Facebook that jellies of this kind had to have so much gelatine in the mix that they would be rubbery and unsuitable for today's discerning diner. But they are wrong. Macedoine jellies can be made with a very light jelly, because the fruit acts as a strong, supporting armature inside.In fact. macedoine moulds are usually larger than the standard jelly moulds because they have this internal support. A lightly made jelly over five inches high will just self destruct. My three macedoine moulds are seven inches high. 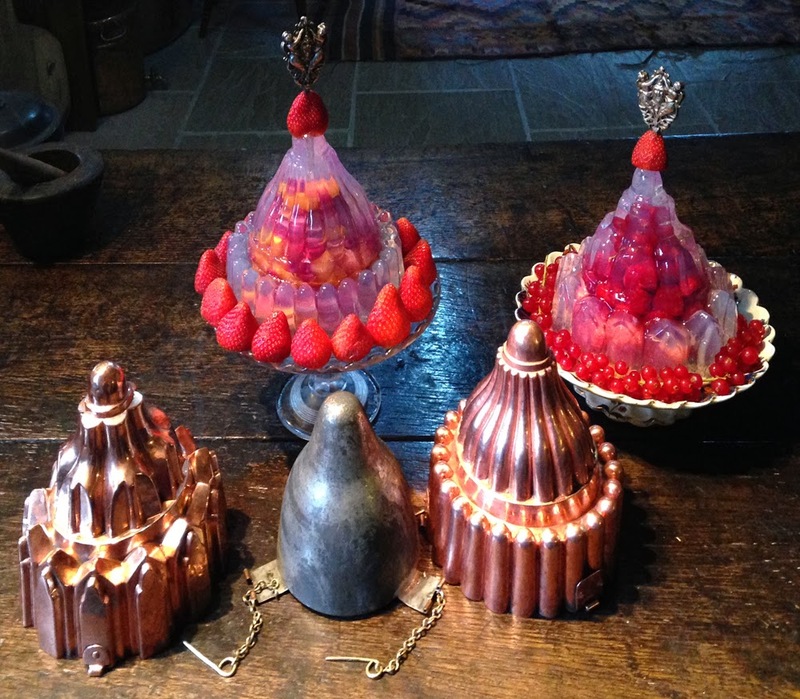 The recipe calls for a jelly lightly set with isinglass (col de poisson) rather than gelatine. Although in the photograph the jellies look as if they have a light blue, almost opalescent effect, In natural light they are colourless and clear. The opalescence may be caused by the isinglass. The jelly was made with Vino Verde, which is about the most colourless wine I know, although the original recipe calls for Champagne. It is flavoured with lemon juice, sugar syrup and maraschino, perhaps the signature flavour of the nineteenth century for jellies and ices. I put the hot mixture of jelly and egg white through a felt jelly bag three times. After the programme is broadcast, they may well be a video available on the web and if there is I will put a link to it.